Subsequently, after one such devastating collapse, a vast subsidence crater was formed to the north of Northwich. 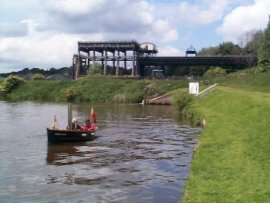 This resulted in the River Weaver flowing backwards for a week to flood the void! This new lake became known as Witton Flash. Later, much of the subsided land was used for the disposal of ash and lime rich waste, by-products of the nearby soda ash industry. A complete infrastructure of cranes, cableways and rails were developed to transport the waste to the tipping sites. The resultant "limebeds" - an unstable highly alkaline paste-like material, with occasional hotspots of contamination, were unsuitable for development and were abandoned to post-operational dereliction. Today brine is still an important resource for the chemical industries in Northwich. Having been used for years as an Army Camp, a Prisoner of War Camp and a refugee camp, in 1975 Marbury Country Park was the first area to be reclaimed from dereliction. The Country Park was developed from the relic landscaping features of Marbury Hall, the former home of the Barry family, although the hall itself was demolished in 1968. The park stood alone as a popular visitor attraction for 12 years before the next phase of reclamation began. The second phase of reclamation began in 1987 on what is now known as Furey Wood. In 1989 Cheshire West and Chester Land Regeneration Unit embarked on a programme of reclamation, starting at what is now known as Anderton Nature Park, and sweeping east creating Witton Flash, Dairy House Meadows, Witton Mill Meadows and culminating in the reclamation of Ashton's and Neumann's Flashes. This programme of reclamation carried out over the past fifteen years and largely paid for by government funding (more recently through North West Development Agency), has contributed 143 hectares to the creation of the community woodland and has made accessible to the public land which was previously derelict and underused. The Northwich Woodland continues to grow and with the inclusion of land around Uplands Farm, it now extends to some 323 hectares of public open space in total. 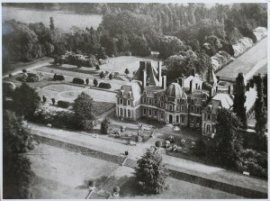 This History of Marbury Hall and Parkland has been compiled by FoAM members Frances Findlay and Alan Redley. Information about the history of the Hall and the surrounding Parkland is frequently requested by visitors, so we have made more of our collected research material accessible.